Over the weekend, I read Fun Home by Alison Bechdel. This graphic novel is Alison's memoir, describing her upbringing in rural Pennsylvania, her family but particularly her relationship with her closeted father, Bruce, and her own coming out. The story is nonlinear, with each chapter exploring different themes while often covering large spans of time. But much of the focus is on the fact that (and this is stated very early in the book, so it's not completely a spoiler) Alison's father died after stepping in front of a truck (which she concludes was purposeful) not long after Alison came out to her family, learned her father had had affairs with men (and boys), and introduced the family to her girlfriend, Joan. Alison feels responsible for her father's death, that he killed himself not because his daughter is a lesbian, but because she was able to do something he never had the courage to do: come out. Instead, he focuses his energy on restoring his Victorian home, reading and discussing literature, and taking his frustrations and anger that he isn't living the life he wants out on his family. 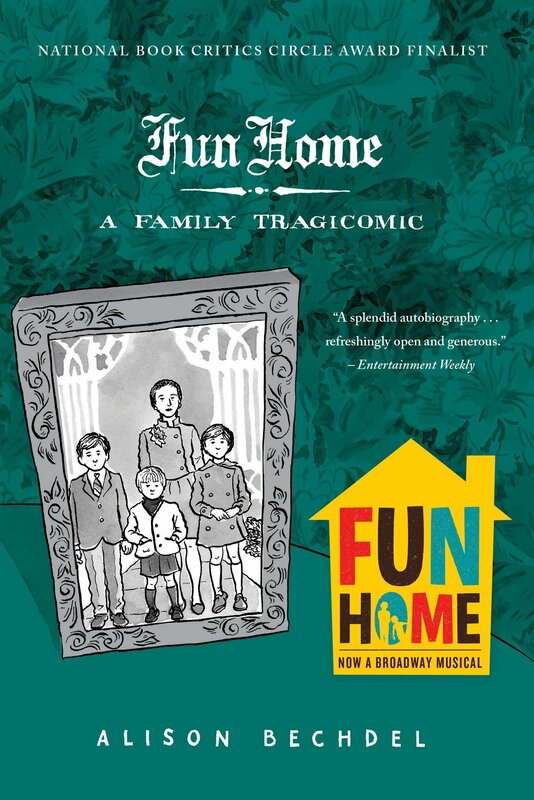 The name of the story, Fun Home, not only references the nickname given to the family business (a funeral home) but also ironically refers to the atmosphere Bruce created ruling over the house like a tyrant. The story was adapted into a musical, which I saw last year and absolutely loved. At the performance, I bought a copy of the book, which has been languishing on one of my to-read shelves for too long. It's a quick read, so if you're looking for a great story you can finish over a weekend, I highly recommend it. Because I'd seen the musical first, I couldn't help but compare to the original and decide what I thought of the adaptation. The play really does justice to the graphic novel, hitting most of the high points while maintaining Alison's story that shifts seamlessly back and forth between comedy and tragedy. But the book really goes beyond the play in drawing multiple parallels with the literature Bruce loved: the story of the Minotaur and the labyrinth, which Alison compares to the labyrinthine home Bruce creates, to hide himself within; James Joyces's Ulysses; Oscar Wilde's The Importance of Being Earnest; and the writings of F. Scott Fitzgerald, Henry James, Albert Camus (particularly A Happy Death and The Myth of Sisyphus), William Shakespeare, and Marcel Proust. She also makes various pop culture references, such as It's a Wonderful Life. In fact, the way she could weave together tragedy and comedy has many parallels to Shakespearean plays, where the death of the king (in this case, Bruce the tyrant) is followed with a comedic scene. There were so many wonderful metaphors and themes that couldn't really be easily adapted into the play. Also, the play completely leaves out Alison's struggles with obsessive-compulsive disorder, which explains some of her quirks and behavioral patterns that were in the play. Though the play doesn't really develop many of the characters beyond Alison and Bruce, the book gives a little more attention and development to the other characters (but still not much, relatively speaking). I'd love to hear Alison explore her relationships with her mother and siblings, though it would make more sense to do that in different work(s). And to be fair, she may have already done this; I just need to explore her work more. Prior to learning about Fun Home, my awareness of Alison Bechdel was in the form of the Bechdel test (which I've blogged about here, and in film reviews here and here). Overall, a quick read that will make you think, laugh, and cry. As someone who has experienced a family suicide, some of those themes were particularly difficult for me, so keep that in mind if that's also a potential trigger for you.